﻿ Tanzania Power Cords, BS1363A Type G Power Cord Sets, Power Supply Cords. View Our Tanzania Detachable Power Cords and Power Supply Cord Directory. International Configurations is a Manufacturer/Producer of Tanzania BS1363 Power Cords. BS 1363 A, Fused 13 Ampere Type G Plug. BS 1362 3 Amp, 5 Amp, 10 Amp Fuse Options. Tanzania Type G power cords are black as standard color. Tanzania power cords in white or gray are special order. Custom length and shielded Tanzania power cords available. Terminated, custom stripping, hanked Tanzania cords available. IEC 60320 C-15 120⁰C connector available on some Tanzania power cords. Cordage - H05VV-F3G 1.0 mm. Plug contains BS 1362 13 ampere fuse. Available with 3,5, 10 ampere fuses. Cordage - H05VV-F3G 1.5 mm. Plug contains BS 1362 13 ampere fuse. Cordage - H03VV-F3 0.75 mm. Plug contains BS 1362 3 ampere fuse. Cordage - H03VV-H2 0.75 mm. Plug contains BS 1362 3 ampere fuse. Tanzania detachable power cords and power supply cords supplied by International Configurations, Inc. meets Country specific standards and current REACH and RoHS requirements. Type G terminology, indicated above for Tanzania power cord plugs, is an alphabetical letter classification coding system used primarily for quickly identifying the electrical configuration of plugs, receptacles and power cords sets used in Tanzania. 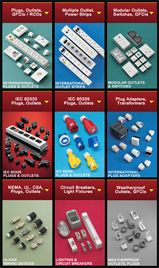 International Configurations, Inc. stocks and distributes electrical devices for use in Tanzania and all Countries in the world. Our extensive and complete Tanzania product line includes power receptacle outlets, RCD GFCI receptacle outlets, weatherproof receptacle outlets, sockets, multiple outlet power strips, power supply cords, light fixtures, MCB circuit breakers, electrical panels, power cable wire, plug adapters and transformers. Contact us for Tanzania electrical devices and power cords.